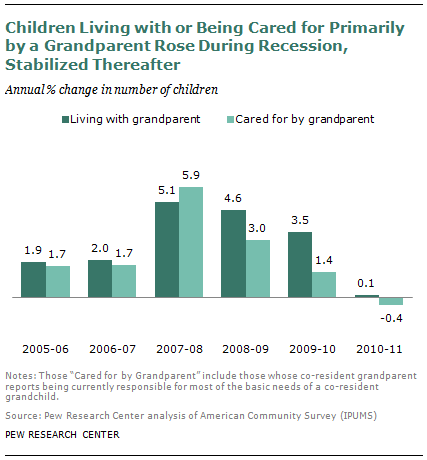 Hard times can act to bring families together, and the Great Recession of 2007-09 was no different: The number of children living with a grandparent surged after the onset of the recession, as did the number of children whose primary caregiver was that grandparent. A Pew Research Center analysis of Census data found that 7.7 million U.S. children — about 10% of all children in the country — were living in the same household as at least one of their grandparents in 2011, and for 3 million that grandparent also was their primary caregiver. Both trends stabilized at higher level after the recession’s official end in mid-2009. But living with or being cared for by a grandparent doesn’t mean parents are out of the picture: In 80% of cases where children are living with a grandparent, at least one of the child’s parents also is in the household. And in more than half of the cases where children are both living with a grandparent and being cared for primarily by that grandparent, at least one of the child’s parents is also present. Rather, these new multigenerational households likely are a byproduct of people losing their jobs, homes or both during the downturn. That shouldn’t perhaps come as much of a surprise: A previous Pew Research analysis found recent increases in the share of young adults living in their parents’ homes; another Pew Research study documented general increases in multi-generational households, and other researchers have pointed to increases in cohabitation that have occurred in recent years as well.